Its politics are chaotic. Its national budget deficit is huge and growing. Inflation is at its highest in 11 years. And nearly 10 years after a catastrophic earthquake turned its capital into piles of rubble, recovery has been, to put it charitably, slow. That’s why, critics say, Haiti is ill-prepared to absorb tens of thousands of its nationals who have been living in the U.S. temporarily for years and who the Trump administration is trying to send back home. 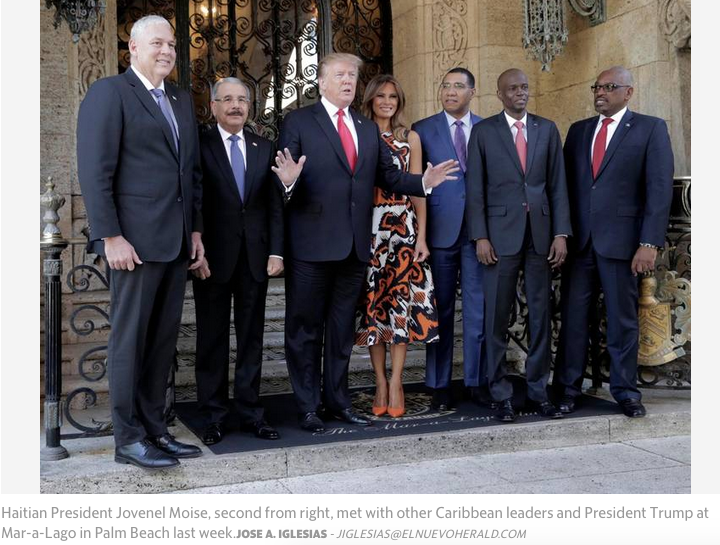 But when Haitian President Jovenel Moïse met with President Donald Trumpalongside four other Caribbean leaders at Mar-a-Lago in Palm Beach last week, he did not bring up the fate of up to 50,000 Haitians whose welcome in the U.S. under the Temporary Protected Status program remains uncertain. “It’s clear that the TPS termination was a decision from the White House, and Trump holds the power to decide its future. Failing to raise it in their meeting is a major missed opportunity to push an issue that stands to affect hundreds of thousands of Haitians both in the U.S. and back home,” said Beatrice Lindstrom, an attorney who sat through four days of testimonyin New York in January in which a cable from the U.S. Embassy in Port-au-Prince, concluding that Haiti was not ready to receive its nationals back, was introduced into evidence. The case was the first of five TPS-related lawsuits to be heard. The lawsuits were filed after the U.S. Department of Homeland Security beganrolling back TPS for Haitiansand for more than 300,000 other migrants from Central America and some African countries. Last month, as the Trump administration continued its fight in the courts to end the special immigration protection, it announced that it would extend the benefit for Haiti and three other countries until January 2020. Haiti, which was supposed to see its designation as a TPS country end on July 22, got a six-month reprieve. On the issue of TPS, Moïse said his administration is focusing its energies on the U.S. Congress. Haiti Foreign Minister Edmond Bocchit has made several trips to Washington, and a group of Haitian senators, recently visited Capitol Hill, he said. While many still hold out hope that TPS holders can find relief in legislation filed in the Democratic-controlled House, some were doubtful of a legislative fix happening after the Republican-controlled Senate introduced two separate immigration bills on Tuesday. One was a companion to the House’s Dream and Promise Act, protecting Dreamers, TPS holders, and Liberian immigrants in the Deferred Enforced Departure program who are set to soon lose the protection. The other was the reintroduced DREAM Act, creating a pathway to citizenship for millions of Dreamers — undocumented immigrants brought to the U.S. as children who receive protections under the Obama-era Deferred Action for Childhood Arrivals program. The House bill “is not going to become law for the basic procedural fact that the Senate has introduced two separate bills to provide relief to TPS holders and Dreamers. It’s more of a messaging bill, designed to amplify the issue which, if executed properly, should ultimately create a favorable legislative and political atmosphere over time for TPS in Congress,” said Maritza T. Adonis, the 2018 Federal TPS Campaign Consultant for the Florida Immigrant Coalition. Adonis said most Washington advocates and an overwhelming number in the immigrant population don’t want any immigration bill attached to border security. Even if the House bill were to pass, Adonis, CEO of MTA Visions, said she doesn’t see it passing in the Senate, where many Republicans either do not believe TPS should be permanent or don’t want to see protections for TPS holders and DACA recipients combined. “The political will does not exist on both sides of the aisle. Republicans are progressively becoming open to providing some sort of relief, but not without some border-security protections, while some Democrats, not all, are not willing to negotiate,” she said. Adonis said she isn’t surprised that Moïse did not raise TPS in his discussions with Trump because some of the foreign governments affected, view TPS as a domestic U.S. issue, not a foreign policy matter. Tom Jawetz, the vice president for immigration policy at the Center for American Progress in Washington, D.C, sees it differently. Jawetz added that Moïse might better have asked Trump for a designation of Deferred Enforcement Departure, which offers a similar level of protection that has been used in the past for countries for which TPS has been allowed to expire, and is solely in the discretion of the president to give . Marleine Bastien, a Miami advocate who traveled to Haiti several years ago to film a documentary about whether the country was ready to accept TPS holders, said Moïse’s meeting was a missed opportunity, especially considering that the Haitian diaspora, of which TPS holders are part, provides over $3 billion annually in remittances to Haiti. That amount is close to 40 percent of Haiti’s gross domestic product, or $1 billion more than its government’s roughly $2 billion annual budget.